Earlier today, it was raining and 43˚. I was wearing a windbreaker over a sweatshirt outside. Now it's -2˚ and windy. The rain we had earlier turned to sleet, then snow that looked and felt like white Dippin' Dots™, then plain old snow. 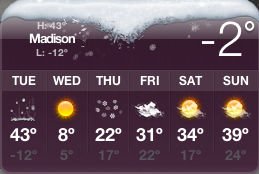 It's predicted that it will get down to -12˚ tonight. That's a swing of 55˚ in about 12 hours. Weird. You stole MY metaphor right out of my brain, you scoundrel!